Counsel Press' New York, NY location is searching for a full-time paralegal to join a seasoned team in the preparation of our client’s appellate filings. Our New York location is a fast paced environment with the most seasoned team in New York. We offer extensive training to ensure your success, and the success of our team members. We are now seeking the right individual to join us for long-term employment, opportunity, responsibility and promotion. 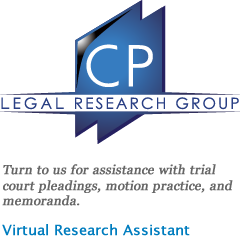 Our clients rely on Counsel Press for very important assistance and we will train you to be an expert in meeting their needs. Counsel Press is a nationwide legal services provider that annually assists over 1500 attorneys with the successful filing and service of over 8000 appeals. Our New York office is seeking the right individual to train as our newest appellate paralegal alongside our established team. The primary service provided to our attorney clients is the rule compliant filing of appellate briefs and records in the New York state appellate courts and United States Courts of Appeals. 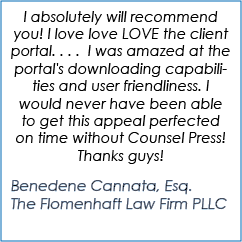 Direct experience with appellate legal work is not essential, but can be helpful. It is important to demonstrate long-term interest in the position and the capacity to meet the requirements of the position through experience and a willingness to be trained. The successful candidate will excel in our process driven environment by having great attention to detail. You will work closely with our staff attorneys and production teams to ensure our client’s successful filings. You must demonstrate the ability to follow directions and adhere to our processes while working within a team to serve our client’s needs. *Email a cover letter and resume, and include a desired salary range: hrjobsny@yahoo.com You must read the directions above and reply with a cover letter and salary range, along with your resume, to be considered. All replies that do not follow the directions will be discarded without further consideration. We will consider all experience and any salary range so please respond completely to ensure consideration of your application.